These projects focus on mutual exchange. Entire groups of German and Eastern European students participate in our vocational school exchange programs, where they have the opportunity to truly get to know the culture and everyday life of their host country. Even student exchange projects always have a practical component where students gain experience in their trade and work on their technical skills. During each exchange, the students work on a joint project that generally benefits the schools or other institutions. Additional projects such as the International Stonemason Dialogue Project promote an exchange of ideas and culture in the trades. A group of German stonemasons regularly visits Lviv to restore a building in the historic town center. Since the year 2000, the foundation has provided apprentices in the construction trades the opportunity to participate in an exchange project with their Russian counterparts while they attend vocational school. The plan is to create exchange projects with additional countries. The first vocational school exchange program for plant mechanics with a specialization in HVAC and sanitary engineering between the German city of Augsburg and the College for Technology and Entrepreneurship took place in 2017. This partnership is supported by the State Vocational College 1 in Augsburg. The two schools first made contact during the “project foundry” organized by the DRJA Foundation. The plan is to host an exchange every 2-3 years. In 2017, a teacher qualification and vocational school exchange program for plant mechanics in the field of HVAC and sanitary engineering was added to the existing town twinning program between Kassel and Yaroslavl. The programs are sponsored by the College for Urban Planning in Yaroslavl and the Oskar-von-Miller School. In addition to providing a forum for the exchange of know-how, the project explores a new style of learning. The Russian participants in particular have commented on the tremendous added value this provides. With a vocational school exchange program for automotive mechatronics technicians, we are leaving the realm of the construction trades. We believe that providing the experience of a forum for the exchange of know-how in this important profession to be so valuable that we are happy to support this partnership. The first bidirectional exchange occurred in 2018 and all involved agreed that this program needs to continue. The program is sponsored by the State Vocational College Neustadt/Aisch and Bad Winsheim and the Yekaterinburg College for Technology and Entrepreneurship. There has been a continued, regular student exchange program between the Badische Malerfachschule Lahr and the Jekaterinburg College for Technology and Entrepreneurship for painters. In both schools, these projects have had a tremendous influence on the interior design of the facilities. Wall consoles, cabinet doors, wardrobe elements and entire decorative murals have been created as a testimony to this collaboration. The first vocational school student exchange for students in Pforzheim, Germany and its Siberian partner city of Irkutsk took place in 2009. This has led to various activities in the carpentry field. In 2016, there will be a second student exchange. A project in Irkutsk that symbolizes German-Russian relationships is in the works. It will feature a large-scale playground and climbing frames with two towers connected by a bridge. In 2007, a Russian sauna hut was built in Irkutsk, which generated tremendous public interest. On the German side, the Alfons-Kern-Schule in Pforzheim leads the project efforts. 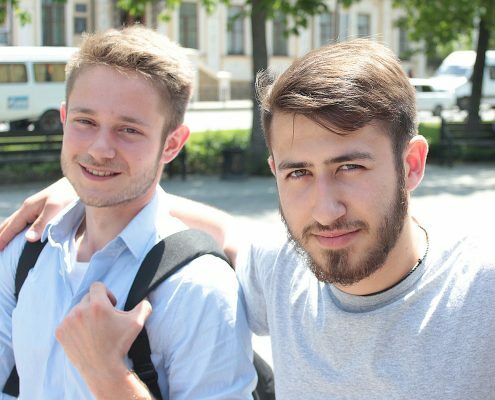 The student exchange program between the partner cities of Karlsruhe and Krasnodar has been active since 2010. Since then, the Heinrich-Hübsch-Schule in Karlsruhe and the Humanitarian-technological College in Krasnodar have been regular collaborators in the field of cabinetmaker training. Pieces for daycare centers are among the results of this project-based work. We have supported the International Dialogue Project for Stonemasons developed by thornconcept since 2011. Every year, stonemasons from Ukraine arrive on site, and two groups of German stonemasons have already paid a visit to Ukraine. On the German side, the project aims to revitalize the baroque terrace gardens in Kirchheimbolanden, whereas on the Ukranian side, needed stonemasonry work is completed in the historic town center of Lviv. Working on their joint European cultural heritage opens up perspectives to the young craftsmen and artists that extend far beyond their own field of expertise and provides insight into the broader context of European culture.